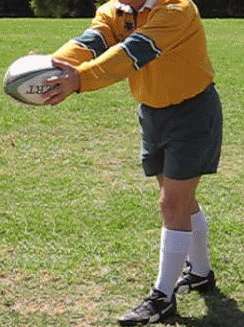 You play good rugby catching a pass is a vital skill. You are an expert and you are a vital part of the team when the ball is moved around the field. It's important you hold on to the ball once you've caught it. Be confident you're handling skills are up to scratch. By doing that you will prepare yourself for catching. Visit or have visited the page catching basics. It`s all part of catching. Good catching is vital, practice! 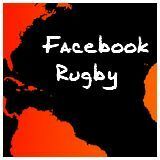 It`s a vital skill for all rugby, especially attacking rugby, which is built on good passing and good catching. You can play a big part in creating a successful team. Be confident that the time you spend practicing alone will be invaluable when you practice with other players. 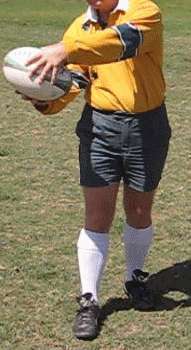 You play an important part in rugby games when you move the ball around the field to search out weakness in the defence. You`ll pick it up easily. From the time you are born you reach out for things you want. Every day you see babies and children reaching out for the things they find interesting. You can remember that! Eyes open, focused on the object you want to hold. Catching a pass is just the same. When you catch the ball you see something you want and your brain takes over. You reach out and take hold of it. You`re a natural! How well you perform this time depends on how well and how often you have done it well before. feel proud of how well you catch, fingers like glue! Catching this pass follows easily from practicing your handling skills. When you receive a flat pass, after leaving the passer the ball travels through the air, across your path, in front of you. You reach out towards the ball. You aim to catch the ball in your fingertips. They all adjust individually and instantaneously adjust to the ball's shape. Your fingers, hand, arm "give" by moving just enough in the same direction as the ball is travelling, so it "sticks". Very similar to the handling practice you do regularly!. The ball slows swiftly and almost at the same instant you use your other hand. You move it swiftly towards the "stopping" hand until the ball is held securly in both hands. Sounds easy. It is easy - when you practice enough. Receiving this type of pass, you will find you can even catch one handed, if needed. You can also allow the ball to be stopped by your raised, bent "outside" arm and clutch the ball to your chest as you run on to it. You can then "fend" with your free arm. The deeper you are behind the player passing the ball, the more the ball travels towards you from in front of you. It arrives at and goes into both hands at the same time. 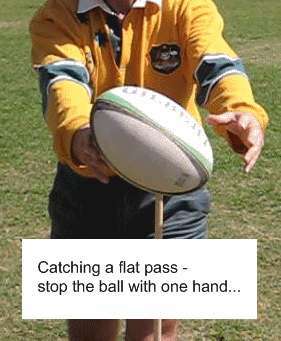 Catching a pass of this type, both hands do similar work. You reach out towards the ball, fingers splayed forming part funnel, part open cage, so you trap and hold the ball. Practice enough and you will even pull in difficult passes. They are the passes around your ankles or over your head or the ones that look far behind you. The more you practice catching a pass the luckier you will be! Everyone else will think that anyway! The photos above are posed and meant to show what your upper body is doing. So what do your legs do when you are catching? They do what you tell them to do. The best way to place your legs depends on what you want to do next. It depends upon the situation - how much time and space you have and what you aim to do with the ball. "Outside leg" - the one farthest from the player who passed you the ball. Catching a pass with the outside leg forward is easier and feels more natural. 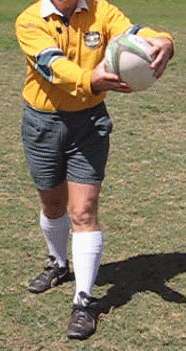 Passing the ball (in the same stride) in one flowing movement having received the pass is more difficult. "Inside leg" - the one nearest to the player who passed you the ball. Receiving the pass is harder and feels more un-natural. This positioning of your legs makes it easier for you to make onward passes, in the same stride, with one flowing movement. You use this type of pass when you move the ball rapidly along a chain of players. You make sure the ball does the work, getting over the advantage line as quickly as possible. You are able to receive the pass and in the same stride, pass the ball in one flowing movement. The pass is much easier. The quality of the pass is usually maximised because you can see more clearly and can move more freely to make the pass. 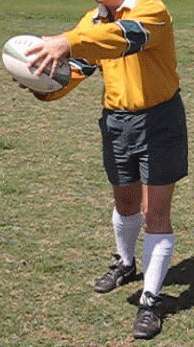 So, reaching out for the ball and putting your best foot forward are both part of making sure you catch the ball well. 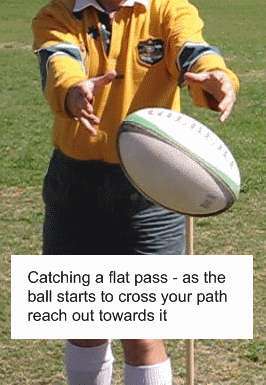 Not only that, it will help you make possible some of the best, most difficult and most useful passes in rugby. In "How We Beat the All Blacks"
many first class players of the time were unable to do it. He is also quoted as saying that it can take a year or longer to teach but it is essential for players to be able to do it. Practice so you have this option when catching a pass. 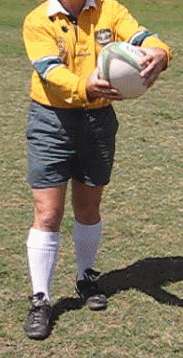 Bob Dwyer, coach of 1991 Rugby World Cup winners Australia in his book "The Winning Way"
(1992 Rugby Press Ltd, ISBN 0 908630 41 7) Page 99 says it was hard to get some of his Australian backline players to do somthing as basic as reach for the ball and pass it across the body. Make sure you master these catching techniques, including being able to choose your leg positioning. You will be a superbly efficient player. Increase the efficiency of what you do and you will be the player people point out as a player who "always seems to have time". Get plenty of practice alone. 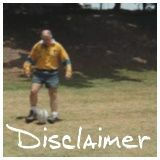 You can just run about, stretching out your arms and catching an imaginary pass. Imagine before that what you will do when you get the pass and choose which leg to lead with. You can do thousands of repetitions in a short time - as many passes as you get in a season! Follow through with imaginary kicks or move your arms across your body to simulate swift, same-stride passes. Imagine seeing the ball right into your hands, then whipping it on to the next player. Make sure your team mates know about these techniques for moving the ball speedily and efficiently.Then you can practice together. Devise ways to use it in games to outwit the opposition. It`s great to improve your own game - and it`s great to be part of a superb team. Discuss the techniques with your friends and see if the whole team can benefit. Follow the link to find other types of catch to master - and share!